From the moment your guests start their adventure with DolphinWorks, they will experience high-quality, professional, personalized and engaging programming that will linger in their memory long after their excursion is over. Our popular “Eco-Discovery” programs are enjoyed throughout California by corporations and groups that are seeking first-class “Edu-tainment”. This philosophy of knowledgeable interpretation and vibrant entertainment is shared by our professional naturalists and biologists who guide each series. We make it a point to engage your guests, whether on the deck of a boat, the sand of a beach, or the trail through a wilderness. We don’t simply point out a plant and state its name, for example. We explain how it is able to survive where it does by ingenious devices and hidden partnerships; we reveal the potent compounds it produces and the ailments healed by those compounds. We discuss the traditional uses of that plant by native cultures for food, medicine, tools, ritual, clothing or shelter, and demonstrate ways the plant can be used today in our own lives. We compare and contrast that plant with others growing in regions where the guests live, and offer ideas for incorporating their own native plants into their yards, gardens, medicine chests, and kitchen spice racks. We encourage the guests to experience that plant through touch, smell, or taste, and leave them with a new appreciation for the value of uncultivated plants that may be growing wild in their own back yards. On our coastal events, we connect your guests to creatures and events in the ocean that they might not have guessed influence their lives every day. We stop to observe the giant kelp forests, pulling close a specimen for everyone to see and touch. This species of kelp is one of the fastest growing plants on Earth (two feet a day), and guests are surprised to learn that every one of us has this plant in us or on us right now, as kelp is used in over 200 products that we use daily, including toothpaste, lipstick, salad dressing, beer, ice cream, cake icing, sauces, desserts, milkshakes, paper coatings, paint, cosmetics and pharmaceuticals. We unravel the complex interaction between ocean currents, ocean temperature, weather, and phenomena like El Nino and La Nina, and explain how those oceanic events affect our lives on land. We tailor each event to the energy and ability of the guests that actually arrive on site. 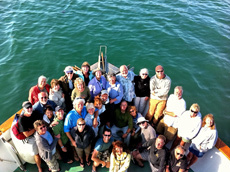 We customize our adventures to the topics and issues that most seem to interest your guests. We engage your guests in the subjects we explore, and include discussions of current global events, while tactfully navigating away from politics and religion. We watch every guest to make sure they are comfortable and that our event is not exceeding their capability. We adjust timing, route, and length of each event if necessary to ensure your guests always feel that attention is paid personally to their needs. All group activities are designed with flexibility to accommodate interaction between the guests’ interests and the selected event. Events can be customized to accommodate clients’ taste, interests, physical energy level, and convenient departure location. California’s magnificent coastal climate and intriguing inland and desert landscapes, along with an abundant array of exclusive destinations and resorts, provide excellent options for year-round activities. 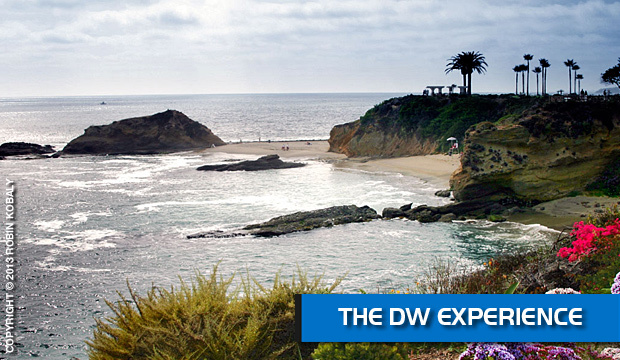 At DolphinWorks, we strive to offer a diverse selection of exciting, unique experiences that showcase southern California’s natural treasures. Read More about all our events! Doug Thompson and Robin Kobaly will host your guests through magical places…on land and on the sea. Your guests will be stimulated by experiences that linger in the imagination long after they return home. DolphinWorks is the trusted choice for destination managers seeking to assure their clients of fun, memorable events.